First and foremost, why is this mockingbird singing all night long and When will it go away? If your sleep is frequently interrupted by the dissonant triplets of a mockingbird, chances are you’re bedeviled by a bachelor bird. Unless you know any mockingbird matchmakers, that young buck is going to be moaning after midnight for weeks to come. Eventually, he’ll come to terms with his lack of companionship but until that time, he’ll be complaining… loudly. Mockingbirds, like all wild, native American birds, are protected by the Migratory Bird Act. You may want to throw a boot at the bird like they do in the old cartoons, but alas, you cannot! To all of you that are having a problem with aggresive and loud mockingbirds, try an water gun! It works great. We have 3 mockingbirds in our yard who constantly used to fuss loudly at us on our patio and swoop down at our cats as they walked around. But we use a water gun that shoots about 30 feet, and now, all we have to do is pick it up and they fly away. It’s great! They are smart and learn quick. A more humane method for ridding your yard of Mockingbirds? While spending time at my daughter’s home in Florida, we had our first nocturnal mockingbird experience. We enjoyed his first few hours of constant singing, but soon became weary from it. That is when my daughter placed her computer speakers in an open window, found a screeching Blue Jay sound file on the internet, and cranked up the volume. No more Mockingbird! I downloaded and made a CD from the internet of a thunderstorm. I did notice this pesky mockingbird would not let another peep out after thunder. The first night it did run it away. The second night, it sang a couple of songs. The next 2 times it paid no attention to it at all. No telling what the neighbors thought but as I was wearing down from lack of sleep it didn’t matter. But now I have heard nothing from this bird in about 3 nights. Either this tactic worked or he did find a mate. Nevertheless, I am sleeping much better. Download a music file of a northern mockingbird singing, play it during the day,and your male mocking bird will move to another place too find his girl.They don’t like competition so one will move on if he hears the singing. Some sources have recommended using pepper to dissuade mockingbirds. This will NOT work. Birds do not have capascin receptors so they can’t feel the heat of the peppers. What if I can’t get rid of a singing mockingbird? Get a Sleep Mate sound machine. I’ve had one for over a year and it’s fantastic, not just for birds, but snoring, loud neighbors, etc. Use a white-noise maker. You can adjust the volume. It’s a much more effective solution than trying to silence the mockingbird. I have had some luck by reducing my negative reactions and increasing positive thoughts. I repeat to myself – “The chirping is sleeping music and I am falling asleep”. I am trying to use Ekert Tolle’s “being in the now” philosophy. It’s June and I’m still hearing mockingbirds in the middle of the night. Why?!? Most mockingbirds do have at least one clutch in the springtime and they mature before the winter arrives. Mockingbirds may have two clutches if the first clutch is born early enough. This is why the scorned bachelor still has hope on a hot summer night. Why are mockingbirds are attacking my cats, dogs, spouse etc.? Mockingbirds are very territorial. In addition, like certain other birds like grackles and blackbirds, they can be fairly aggressive in protecting their nests. When they feel their progeny are threatened, they won’t hesitate to divebomb bigger animals, though they rarely strike. This behavior will persist while the chicks are vulnerable. Interestingly, some mockingbirds will take over a backyard feeder and harass other birds. This may be triggered by a seasonal shortage of food, in which case it may persist through winter and subside come spring. Does the mockingbird have its own song? The song of the mockingbird is actually a medley of the calls of many other birds. Each imitation is repeated two or three times before another song is initiated. A given bird may have 30, 40 or even 200 songs in its repertoire, including other bird songs, insect and amphibian sounds, and even the occasional mechanical noise. This remarkable mimicry explains why the Northern Mockingbird is known scientifically as Mimus polyglottos, which comes from the Greek “mimus” to mimic, and “ployglottos” for many-tongued. How can I distinguish male and female mockingbirds? There is no obvious way to distinguish between male and female Northern Mockingbirds. Males are much more vocal, especially in spring, but the two genders share similar plumage. Do mockingbird chicks have a tendency to fall out of their nests any more or less than the average bird? As far as I know, mockingbirds do not have a tendency to leap from their nest any greater than most other songbirds, but like most songbirds, suffer a high mortality rate. What if I find an orphaned chick? Please contact a licensed rehabilitation center for songbirds in your area ASAP. Don’t attempt to raise a baby bird. I’m going to attempt to raise a baby mockingbird anyway. What should I feed it? Some species of mockingbird such as the rare Galapagos Island birds are endangered. The more well-known birds like the Northern Mockingbird are thriving. How long until the babies fledge? Mockingbirds fledge or leave the nest within 12 days of being born. Northern Mockingbirds live about 8-9 years in the wild. Why are mockingbirds so cool? I’ve noticed out here in AZ that mockingbirds don’t take no jive from anyone, even cats. I had an outdoor cat at my old house and there was a pair of mockingbirds that nested in the tree out front (I think it was the same pair year after year, not sure) but they did not take kindly to him being around, they would dive bomb him daily especially during the spring and early summer. I came home one day and there was the poor cat huddled in a ball at the front door with a mockingbird on the left and one on the right each taking turns pecking at him and tearing hair out. My cat must have really ticked them off. They also would make fun of my niece as she put it. My niece was only 5 or so and loved playing outside and she would always gt hurt and come in crying, and her crying is one of the most annoying loud sounds EVER. Well the mockingbirds started repeating the noise and it seemed that they associated it with her being outside. She started coming in crying saying “The bird is making fun of me”. We’d go outside and as soon as my niece was out there they would start making the same sound she did when she cried. It was one of the funniest things I’ve ever heard. If you have more information about mockingbirds you’d like to share, please do so in the comments section! Here in California the Mockingbirds are the ones that pollinate our guava trees. The red and white guava (Feijoa sellowiana) flowers have sweet, fleshy petals. The Mockingbirds (and the Hooded Orioles, too) grab these petals, yank them off and eat them, and in the process, pollinate the flowers (which are not visited by honeybees or other pollinators). I have one guava tree the Mockingbirds are very territorial about, and it, of course, has the most fruit. Fruit by the way, is green on the outside, white inside, and tastes great! Is there any type of house that mockingbirds live in? I am a nurse’s aide and my client has a mockingbird that has taken over the yard. He knows when I throw bread out for him because he’s there waiting for it to hit the ground! LOL His favorite is cornbread. But we wanted to know if there is any type of house we could build for him/her? He is a real treat to watch. Thank you for your help. Nice, Brenda. As far as I know, mockingbirds won’t live in birdhouses. Sounds to me like this bird is pretty comfortable already! I am having some landscaping done and a large tree in my yard has to go. Each year that tree is home to a/the Mockingbird and I wonder what I can do to accommodate the birds. If there is a nest with eggs can I move it to another location in another tree? Can I time the tree removal to the 12 day period when they nest? I love the Mockingbirds and their constant singing. Is it possible that the same birds return my tree? He has now become our “guard” bird!!! LOL Mr. Mockingbird loves cornbread so we set a dish out on the table under a covered back porch and he comes by quite a few times a day to eat. If, God forbid, another bird comes by to “his” dish, it’s “look out!” LOL Mr. Mockingbird is running them off. He is funny to watch. Can’t wait for warmer weather. We are hoping he will eat out of our hand. He has tolerated me coming out the back door and he watches (from a tree nearby) me put his cornbread in the dish. I have had a Northern Mockingbird coming to visit up close for over a month now. I started putting wheat bread out for the birds til I got my feeder up, and here one came. Every day. He just looks at the seed….he loves the bread ! So now, if I go outside…he comes right up to my feet…within about a foot. Last week, another one started coming along. They seem to be together more and more, so I am assuming its a mate. Totally non-agressive towards me. I am really enjoying this interaction ! I have also gotten some great pictures since they come so close to me. Patricia, the mockingbirds are probably more wary of crows than they are of you, but I’d wear a hat anyway! Now “our” mockingbird has taken over!! I read that they like raisins so bought a box and we put a few out in “his dish” everyday. Since the weather is getting warmer, we have seen 2 other mockingbirds coming around. When they even dare to go near his dish to get a raisin, he is right on them chasing them away. This bird is such a pleasure to watch. It seems he made himself right at home and will be here for a long time to come! I am sad to say that “our” Mockingbird couple seem to have deserted their nest after the incident with the crow. I have not seen them in 3 days. I went up the ladder today and found a beautiful, complete, empty nest. I am amazed the crow could see it as it was built deep down under the rose canes. My husband said they will build a few nests and then pick the one that is the “safest”. Is that true? If so, I guess the crow made them decide it was better not to have babies in the arbor nest. Crows are known as generalists in terms of feeding. It is a more likely scenario that the crow ate the eggs and the Mockingbirds abandoned the nest. Hate to rain on the parade lol. I hate to think that the crow ate the eggs; although, it is certainly possible. I do know when I was watching him try to get to the nest, he was unsuccessful as the Mockingbirds were all over him. Later, when they were all gone; I checked the nest, and it was empty. Do you think he would have continued to try to get to an empty nest? At any rate, the parents did not come back, and we have a perfect little nest buried under the roses on our arbor. We discovered a Mocking Bird nest in a bush right outside of our kitchen window about 3 weeks ago. Shortly after, we noticed the nest and 4 new chicks had appeared. Both male & female faithfully fed chicks 24/7 for what seem like just a few short days while in the nest. Now the chicks are out of their nests and resting on branches and stiil one of the parent birds feeds them continously. Do these birds mate for life? Could this be the Male or Female that continues to feed them? We had very bad weather overnight and we only see 2 young birds now, but the parent seems never weary to care for them. The bushes were once filled with all sorts of beautiful birds during the day, but since the Mocking Birds moved in they have all disapeared. No matter, it has been a rare treat to view the Mocking Birds in this way. We had two active nests. Not sure if the same “couple” have created simultaneous broods, or we just have many loving Mockingbirds in our yard. One nest had 4 (possibly 5) eggs; 2 in the other. Yesterday, after a thunderstorm, the eggs were missing from both nests. I witnessed a Mockingbird attacking two Crows, so I assume the Crows ate the eggs. I believe something ate 2 eggs I saw in another nest two weeks ago. I have a large Black Racer in the bed where the nest is, so I’m not sure if the eggs were eaten by the snake, Crows, etc. One nest in my yard provided a lovely home for 3 Mockingbird fledglings…but no such luck with subsequent nests. Will Mockingbirds lay eggs in the same nest more than once? I don’t want to remove the nests if there is a chance for more babes. BTW, Mockingbirds do not seem bothered by me, my husband, or our large dog who loves to sit under the nest. My kitchen window overlooks my backyard and I noticed a crow hanging around and then all of a sudden two mockingbirds were flying around telling the crow to go away. The crow did not, so I went out and yelled at the crow. The crow went flying away and the mockingbirds went after the crow. While they were gone, I peeked in a bush near the back fence and found a nest with 3 eggs. I knew for sure the Crow will be back. So, I covered the bush with a beach towel so the crow couldn’t snagged the eggs so easily. I made little openings so the parent birds can get in and out. The birds love it. I also put a statue on the fence so the crow would be a little bit more uneasy of sitting on the fence. The crow hasn’t been around. One day I noticed a lot of action from the parent birds. In and out constantly from the bush with the beach towel roof. I thought “I bet those eggs hatched”. So, I went out and lifted the towel and spread the leaves apart and there they were. 3 baby birds. I started leaving sliced fresh papaya inside the bush and I would come back and find it all eaten up. I go out there all the time and leave fruit for the parent birds. They sit up on a tree and watch me. They have never attacked me. I really believe they know I am harmless. Our backyard jacuzzi sits 2 feet away from the nest. I used the jacuzzi the other day and while I am sitting in the jacuzzi…the birds keep going back and forth into the bush with food in their beeks for their babies. They don’t seem to mind I am right there. I think they know I helped saved them from the crow. It is so sweet. They are spoiled and I think they know that. They get fed fresh fruit every day. I even go out and talk to them when they are sitting there on a branch looking down at me. They watch me lift the towel and peek at the babies once in a while, but never attack. I have grown fond of Mocking Birds because they are very smart and they work hard taking care of their babies. I am just worried about the babies leaving the nest and falling into the jacuzzi and drowning. The jacuzzi is practically under the tree bush. They should be leaving their nest soon. I may find a tarp and cover the jacuzzi. Anyway, I am really enjoying these amazing birds. Because I spoil them so much, they may be back next Spring. OMG…they are so noisy….uuugghhhh. tree back. And now we have a mockingbird sitting on the nest again. Would it be the same ones ? I am totally fascinated by these wonderful birds. In fact I prayed that they would build a nest in our tree. Thanks for your website, and information. Well, the jacuzzi was a threat. I found a baby bird dead after trying to fledge out of the nest that was above my jacuzzi. I just knew that was going to happen. Very sad. The other baby is still in the bush and is stubborn about fledging. It has been 16 days and she is big enough to leave the nest. The baby is cute and very shy, scared and timid. Don’t know what happen to the third bird…hopefully, its fledging was successful. The mother stays around and continues to feed and protect the baby in the bush. I put a pet fence around the jacuzzi….I hope that helps save this little fella. I was reading how there is a high mortality rate for baby birds and many of them only live up to 10 months. Wow. Very sad for how hard birds work to build a nest, sit on the eggs and find food for their young and protect them from predators. Tough world out there….no wonder why this little fella doesn’t want to leave its nest. We have a single mother raising three chicks in the oak tree in front of our house. It is quite comicle to watch here chase the squirrels away and dive bomb the neighborhood stray cat. One day while sitting on the porch we saw a blue jay fly into the nest and knock one of the baby mocking birds to the ground and my wife chased off the jay. I got the ladder and my wife used her gardening gloves to pick the baby off the ground. I used the other glove and put the baby back in the nest. I couldn’t see into the nest so gently dropped the baby back in on top of its brothers. We guarded the nest for almost 15 minutes before the mother returned. She rearanged the babies and then fed them. She made 3 more feedings before sitting on them for the night. Well we got curious as to what to feed them so the mother would not be gone so long and found this site. The mother will find a tray of raisens in the morning near our porch. Thank you for this site. we found a baby mocking bird egg and it hatched last night we dont know what to feed it or what to use to keep it warm and its mom got killed bye my cat.CAN YOU HELP US SAVE THIS BIRDS LIFE? do mockingbirds use the same nest or not? i have not found anyone able to answer this question. if you have the answer, please let me know. If you have a bird sanctuary in your area; I would take the baby there immediately. By the time this is posted; you have probably already done something; I have always had little success with baby birds unless they were a little older…just fed mashed up bread with warm milk from a dropper. Will the mockingbirds come back to the same nest next year like our annoying swallows? I believe we have a Mockingbird couple who have built a nest in our hybiscus tree. The birds do not seem to be bothered by our golden retrievers, who lay around and sleep all day. If one of the babies falls out of the nest, what should we do? I live on Long Isalnd and about 3 weeks ago I started hearing a mockingbird’s nightly song. It made its home in a tree on our front yard and would fly out and proudly sing on the telephone wire just a few feet away. We loved the sound “our” little bird made. Well, my neighbor across the street just told my husband that it was keeping him up at night, so he shot it with a pellet gun. When he noticed my husband’s reaction he claimed he was just kidding, but we have not heard it singing tonight and know that we will no longer hear its sweet song as we doze off to sleep. Mechelle: I have learned that it is fine to pick up the baby bird and place it gently back into the nest. Better back in the nest if it isn’t ready to fledge yet than to leave it on the ground to predators. What is the lifespan of a Mockingbird, please? I haven’t seen him attack any people but we do get a lot of crows. He does very well at keeping them away. This may be a dumb question, but why do mockingbirds when walking around on the ground open they wings, hold them outstretched for a moment and the close them. The bird walks a little distance and does this over and over again repeating this. I was wondering if it was a mating ritual or a defense tactic. Rarely strike? Not the ones that used to live in my neighborhood in North Dallas. For a time I could count on regularly getting smacked in the back whenever I went out to tend my garden. During the same time, one would repeatedly whack my cat whenever he walked on the fence. That was years ago and a different location. I’ve got a new pair that show up to complain whenever the cats go in the back yard. I’ve seen some near misses, but I’m waiting for a direct strike. I have a baby mockingbird in my front yard. She seems to hide in the bushes. How long does it take for a baby to fly? We live in Southern Illinois and I have noticed that every year for the 6 years we’ve lived here that the Mockingbirds stop singing early in the morning,precisely at the end of July. Noise all spring and into the end of July, then on August 1, silence. 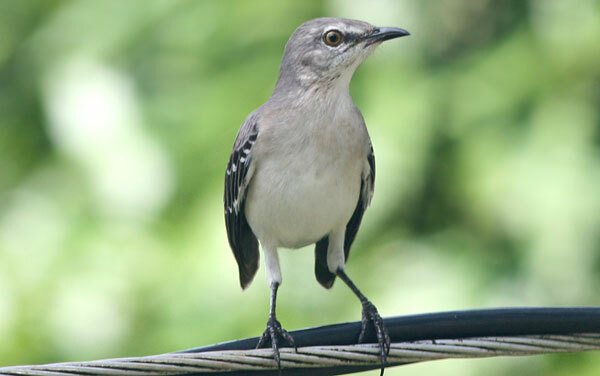 Does the Northern Mockingbird migrate? If so, when? i am hoping to save some nothern mockingbird eggs because last summer me and my friend saved these two little nothern mocking brids and the mother keeped them and it had been atlest 3or4 weeks after we sade them and we fond blue-sky on the ground deid and i poromis my self i would try to save all the baby nmockings i could with the help of my mom and friend bob and hes going to make a solar powerd incubater but we doint no how warm it needs to be to keep the alive in the incubater so how warm does it have to be?? Sam, I wish I could help you but I have no idea. I don’t see how the eggs are even viable any more. Mike, I live about 30 miles East of Dallas and I have a big problem. I left my window down in my pickup 05-04-11. Next day I saw a mockingbird sitting on the window sill of my truck with a twig in it’s mouth. It hopped into my truck and put the twig down by the speedometer. It continued all day and the next and next. Today, (05-09-11) I have a full blown nest that she’s built right up between the speedometer and steering column. I have pics of her and her progress. Now,,,I need to roll my window up because of rain and I don’t want her to lay eggs in my truck because of the mess. What can/should I do? By the way, just last week we lost the last of 4 baby mockers on our back porch right beside our door. We stayed away from it and really wanted those little babies to grow up. We love mockers here in the country. Gene, you’ve got quite a dilemma on your hands! I feel bad for you, especially since you don’t seem to have any good options. You’d better get that nest out of there before mama lays her eggs. Hi there! My kids and I are heartbroken….and baffled! After watching 2 mockingbirds building a nest in a close-by pine for days on end, we carefully looked in this past Sunday (Mother’s Day). Two eggs had hatched and one was gently shaking!! We quickly walked away, and I watched the tree on and off for two days, only to notice no mockingbird activity. We looked again today, and discovered an empty nest. We are so confused and really sad!! Was it our fault? Did we lead a predator to the nest? Did the mother relocate her babies? Any/all input would be greatly appreciated. Thanks so much. nice to see what Ruby and Tori said….and shame on anyone who wants to get rid of mocking birds. we had mocking birds building a nest in the hedge of our backyard last year and were delighted. this year they chose to build a new nest in our neighbor’s tree and now two couples of cardinals took over the feeding station and bird bath and do their best to get along with each other. wild birds are a marvelous gift of nature and should be appreciated. My cat was lying beside a baby mockingbird a little over week ago. It was not fully feathered so I brought it inside and fed it a mixture of wild bird seed, minus the sunfower hulls, small breed dry dog food, a few duck pellets and cracked corn, put through the coffee grinder until it ground finely and then mixed it with enough water to make a runny paste. It loved it and I had to feed it every 15 minutes during daylight hours (it even went to work with me everyday and sat in one of my office plants from 8:30 to 5:00 M-F). I had it a week and it had gotten all of it’s feathers and had lost that “baby bird” look. I kept it in a container that was clear with air holes and perches and it did well in it during the 45 minute drive to and from work, but once it got home it wanted to get out really badly. When it was able to perch well I would take it out to a small tree and let it sit in it for a bit and it did peck at the leaves on the tree and the ants that were crawling on the tree, but it didn’t try to feed itself as long as I fed it. Anyway, after I had it for a week, I put it in the little tree and it flew to a taller tree before I could get it. I called it and it would answer me back, but wouldn’t come down. It stayed in the tall tree all night and was fine when I checked on the next morning. I had to leave to go to work, but came home at lunch and it had flown back closer to the house. Again, I called to it and it answered me constantly, but then it flew across my backyard which is about 3/4 of an acre to a more wood area. It’s stayed in that area for several hours and then it was gone. I am sick to death that I let it go too soon and am worried that it couldn’t fed itself properly. Do you think it will be okay since it could fly as well as it did? Maybe leave some meal worms in a bowl for him by a window and if he shows up then you are at peace of mind that the bird is surviving. The bird could be visiting you and you may not know it, but if food is left out then maybe you can get sight of him and know everything is fine. I go to the area I last saw it and call out it it every day, but have not heard anything that sounded like it. We have had two bad storms since he flew away, which makes me also worry. The only thing that is giving me any comfort at all is knowing that it is one of God’s creatures and there is instinct for survival bred in him. When I had him, I made sure that I didn’t handle him anymore for than necessary as I didn’t want him to be imprinted on me, but I was still in it presence from dawn till dusk for a week. I hope you get a sight of him. I know that you just want to know if he survived. You could still try leaving some food out. Good luck. I had a mockingbird nest in my tree outfront, but Im trying to figure out if she just laid her eggs or whats going on. Doesnt seem like she sits to long. She comes and picks around then sits for a lil them flies away. Or it looks like maybe mom is sitting on eggs and dad is bringing her food is that even possiable? Or how much time does mom spend sitting on the eggs? Mockingbirds are as good as it gets to being parents. You are correct that the male gets food and the female stays by the eggs. Parents will also take turns and the female will get food and the male sits high atop a tree and plays guardsmen. My mockingbird eggs have hatched and I have meal worms in a bowl by my window and I see the male come and fill his beak up with worms and then land on the ground and cut them up and then scoop them back up and take them to the babies. Then a moment later, the female shows up and scoops a bunch of worms in her beak and then flys back to the babies. The funny thing is that the female doesn’t crush up the worms for the babies, but the male does. Interesting. I just came upon this site as I have been attempting to understand the experience I had 10 years ago. My mother was in my home and had been diagnosed as terminal with congestive heart failure. For a month she had been in and out of reality. One night a mockingbird sang all night outside my bedroom window. I had never heard the bird before, and I never heard it again after that night. I dreamed that my mother stood up (she had been wheelchair bound for 2 years) and could walk. She told me she was going to be okay. The bird kept singing in the background as I would wake up and go back to dreaming. I got up at about 5:00 a.m. and went into her room where the hospice nurse was sitting with her. I told her that I loved her and that it was okay to go, then I went back to bed. Ten minutes later the nurse came in and said it was time. I went in and Mom was gone. The bird stopped singing and I never heard it again but I never forgot the symbolism of that night and the beautiful song of that bird! I moved back to California 5 years ago to care for my father who was terminally ill with lung cancer. Not long after I moved in with my Dad, I noticed the wonderful sounds of a mockingbird and spent many long nights sitting on the patio talking to my new feathered friend. I was fascinated that he seemed to respond back to me when I would talk to him, almost as if it was a game. He would also follow me. If I was in the back yard he would sit in tree near me there, but if I walked to the front yard he would fly over the house and sit on a tree near me and continue chatting. Each year for 3 years in a row he would show up for about two months and then disappear. He became a comfort during a difficult time. When my Dad passed away 18 months ago, I had to sell his home and move to another neighborhood about 5 miles away. I hadn’t thought much about my bird friend in quite some time, but had noticed how quiet this neighborhood was at night. The, 3 days ago, I was coming home from somewhere at about 10 pm. As I started to open my front door, I froze in place as I heard the familiar chirping and singing once again from only about 15 feet behind me. I must admit, I actually started crying because I just couldn’t believe it could be the same bird. I still have no idea if it is him … but this bird chats with me the same way the other one did and has returned each evening singing non-stop until dawn- he is outside the window now just chatting away, probably driving the neighbors nuts 🙂 Most likely a coincidence I imagine, but I think I’ll always wonder if there is any logical explanation of how he could have found me and if he will return again next year ??? I THINK God knew that you needed a friend. How sad! Human beings have robbed the land of the wildlife, chopped up everything and replaced it with an I ME MINE self righteous greed for turf. How awful it must be, then, to help out a little mockingbird to rear its babies for a little while! Poor you! How sorry I feel for you poor folks! Really! What an audacity that they may come to your garden, asking for your mercy to secure their lives! Someone smack yee! About 2 months ago my dog pulled a mockingbird nest down and ate 3 of the babies before we caught him. The last one was a bit bedraggled but we thought since the dog ate the nest, we should take him in. We fed him cat food and mealworms and he has thrived! He had a few feathers but not alot and now he is pretty much full feathered. The only thing is, he wont fly away! I did try to get a bird sanctuary to take him at first but they were too busy or something to even return my calls! So he sleeps in the house is a special cage we made for him and spends his days outside. Never goes far and he always come running when I talk to him. Wondering if he will ever decide it’s time to leave home or if I have a new pet. Anyone? That has to be the cutest thing having a baby mockingbird just love you so much and follow you around. How cute is that!!! Maybe you should get into the bird rescue business….you are GOOD. Congrats to you on saving the little guy. The only advise I have because I am not an expert on this situation, but is to try to call the bird sanctuary people again and see what they suggest. It seems dangerous for the little guy to go out on his own because he didn’t have mama or papa bird to teach him the tricks of hunting food and protecting himself from predators. I am from California and it is illegal to keep wild animals or birds as pets…..so I would try the sanctuary again. Good luck. Also, to save money on meal worms, if you are still feeding him, they sell Freeze-dried meal worms in the pet stores and you just boil some in water and they become soft again. Saves money and also not having to have meal worms in your frig. I put 1/4 cup of water in a measuring cup and boil freeze-dried meal worms for 2 minutes. My backyard mockingbirds love them. A pair of doves made a nest in the yucca in back of my porch over the weekend, but now it appears that a mockingbird is fixing it up for him/herself. Is this possible? I can’t get a good look at the mystery parents, but there is a dark upturned tail, white throat and rump, and black bill. Its shape does not resemble a dove at all. My question is what can I put in a bird feeder to feed a mockingbird? I love birds and my friend is starting to talk to us and sings to us all the time. I want to keep him around so I can teach him more calls and words he is already saying words like here kitty kitty and he knows how to call our dogs. I know it is a male he is loud and sings all night long and during the day as well. I want to help the little friend out he is very interesting? any birdseeds will be fine for mocking birds. they also like birdbaths. we did that and had mocking birds nesting in our jasmin bush. don’t be surprised if your male bird stops singing. they do that to attract a mate and stop whenever they found their partner. we were so disappointed about it until we knew the reason. enjoy! My mockingbirds in California do not eat any bird seeds. They like meal worms. They are a pain to buy alive all the time and costly, so I go to the pet store and purchase a bottle of Freeze-dried Meal Worms. Yep, they have these. One bottle goes a long way, too. Just put a a couple pinch full of dried worms in 1/2 cup of water and boil in microwave for 3 minutes. This softens them up…..then I have my little ceramic bowl that a fill just a tad of oatmeal flakes and I pour almost all the water out from the boiling water that the worms soften up in and pour into the bowl of oatmeal. If you buy fresh meal worms, the pet shop has the worms in crushed oatmeal….so that is where I got that idea. Then I just set the bowl out where the MK knows they are there. It may take a couple of days for them to feed on it, but they do and love it. If it is hot out, then the worms may dry back up, but I keep them in a little water to keep them moist. I have seen the MK parents come and put a dozen in their beak and fly over to feed their babies. It makes me feel good that I am helping them feed their babies. I also see these other little sparrow birds come and eat the moistened oatmeal. They don’t touch the worms, but like the oatmeal. My finch and goosebeak and Scrub jays birds all like the seeds, but MK’s do not touch the seeds at all. They go for the meal worms. But, I am in California….maybe the MK’s out here have a different eating pattern. Our babies have just left the nest and now we see the adult Mockingbirds still hanging around swooping at us. We have just discovered another nest placed on the ground in the same bushes about 10 feet from the original nest. Could this nest be for more babies or is it for the first set of birds to be safe and lower to the ground? Mom and dad are really protecting the area still. Let me know. Mockingbirds will nest more than once in the Spring and through the summer months. Does anyone know if mockingbirds return to the same place where they were raised every year or if they even ever leave the same area? I have heard that Mockingbirds are nest robbers — that the reason they imitate birdsong is to identify nests of other species eggs and young to feed on them. Truth? Or bullsh&#? Thank you for your excellent blog. I tutor in Northern and Southern California all subjects including test prep. I will steer clear, though. I do not seek to compete. mocking birds are so annoying but they are so pretty. Hi! My children recently found and fell in love with an abandoned baby mockingbird. Though we plan to release it, I was wondering if it is legal to own a mockingbird in the state of Texas? If so, is there a possibility of legal troubled heading our way for attempting to nurse the little fellow back to health. Hello! We recently had a mocking bird lay her eggs in a small tree in our backyard. Because we have 6 dogs who often go outside.. we made a low screen enclosure around a large area of the tree.. However we have been doing landscaping and with the dog activity.. I think that the Mockingbird may have decided to move her nest because after about a week or so .. they are now all gone. We do not have any squirrels in the area.. and there is no sign of damage to the nest. Could it be possible that she moved the eggs? If a mockingbird mimics the sounds and songs of its region, what would it sound like if it was raised in isolation? Several days ago my lab ate a mockingbird. There was nothing left but a pile of feathers and down and the remaining mate is now diving at my dog anytime she is outside. I can only assume they were diving at my dog and she simply caught one. I feel awful about this as I have fed and watched the bird for several years. I even make homemade suet and they perch on top of the feeders and looked at us through the window. Now the remaining bird hovers around the house waiting for my dog to come outside. It even brought another pair….I can only assume to show them my dog. I have been sick about this but, after some research, am hopeful that the remaining male will find a mate this year as it is still early. Does anyone have any experience or knowledge of a similar situation? I know the bird is missing its’ mate and angry at my dog and it is even perching at different areas near open doors and windows where it can see the dog and squawking loudly at the dog. This morning the Mockingbird parents where feeding their young. This was still going on inb the afternoon. I went out to dinner around 6 pm and when I came home I noticed the nest was empty. Where could the babies have gone. I don’t know how long it has been since they hatched but I remember see that the babies had down looking feathers. I love stories like yours Kevin. I have Mocking birds come every Spring to feed on the meal worms that I leave in a white bowl every Spring. It is right outside my window and they come and fill their beaks to the MAX to take to their newborn babies. Too cute. Love it. Lucky your little guy didn’t get caught by a predator or ran over. Very lucky. Enjoy. One of my neighbors posted a question on the list-serv about what bird might have caused damage to her windshield wipers more than once and smeared bird poop all over her car mirror. I wondered if anyone knows of this sort of behavior in mockingbirds(?) We are in NC and have an assortment of possible culprits – crows and turkey vultures, for example – but I was thinking that mockingbirds had the personality. On the other hand, they seem too smart to be fooled by reflections in a mirror or window. Thanks. You need to feed the baby mealworms or baby bird formula so that its getting protein and nutrients. Fruit alone doesn’t have enough vital nutrients to sustain him and keep him healthy. Remember, no milk or bread. This can choke & kill them. Baby birds don’t nurse so they do not drink milk–it is bad for them but many people don’t know this. Seagulls can eat bread but not baby songbirds or others. Last year we found a fledgling that my dog tried to eat. He killed the sibs so we brought him in and raised him. Fed him mealworms and cat food. He used to sit on my shoulder and always came to me when we were outside. If he stayed out late, I’d find him on the step next to the door waiting for me.Come the fall, there was an adult that kept following him and aggravating him. One day they both vanished and he didn’t come back. I was heartbroken. Thought he was dea. This spring he came back with a mate! They are on their 3rd nest now and we make sure the dogs cannot get to them. Oh, and I know it’s him as he still comes to me when I call him. My question is how do you KNOW it was YOUR bird that came back with a mate? Unless you tagged his leg or if he had some other mark on his body for you to identify, how do you know? Mockingbirds all look the same and you can’t even tell (by looks) which is the male or female if you see a nesting pair. You can only tell by their behavior. Mockers also chase off other mockers–even their own offspring–because they don’t give up their territory. I have a feeling the mockers you’re seeing are not “your” bird, but the ones who chased him off. However, I am glad you’re keeping your dogs from getting to them! I was sitting in my swing today and observed that I have two mockingbird nests in my chaste tree. A mocking bird flew to one nest, stayed a few seconds, and then quickly flew to the other nest. Is it possible for the parents to have two nests at the same time? I have never seen that happen before. The answer is yes. Mockingbirds have 2-4 nests going at the same time during nesting season. The babies have a high mortality rate so I’m sure this is nature’s way of ensuring some of them survive. The father usually feeds the nestlings & fledglings while the mother incubates new eggs. The babies leave the nest at about 12 days old and cannot fly, so many of them are killed by predators. Hope the ones near you make it! Thanks, Kelly, for the info. I always enjoy watching the Mockingbirds and now will pay close attention to keeping them as safe as possible considering I have a cat. Of course, those parents do a pretty good job at attacking when necessary. I, too, hope they all make it. I just saved a baby from a cat the same day it left its nest. Right now he’s 16 days old and we put him in a tree to watch as the parents keep feeding him, but at night we bring him inside in a cage. We’ll do this until he can fly. The babies make this little “screech” noise when they’re hungry and any cat that’s outside seems to hone in on it. Once they do, too late. I happened to be standing right there when the baby hopped under a shrub and then began chirping to let his parents know where he was. When I turned to walk away, there was a cat 3 feet from me about ready to pounce under that bush! Thank goodness I was there. The parents DO dive-bomb intruders but they are no match for a fast cat that has their baby in seconds. UI found a baby mockingbird and could not find his momma.I have been feeding him dog food mixed with water(spongelike consistentcy)and he loves it.But now he is starting to get his tail feathers and I need to be feeding him worms.I thought about mealworms but can I feed these too him whole or do I need to crush them up??? thank you!! I know it’s him because he still comes to me when I call him. Why would a strange bird come to my arm? If it’s him then great. As I said before you can only tell by their behavior, so there ya go. It’s just unusual for the others to leave their turf and let him take over. You can still feed him the wet dog food and don’t necessarily NEED to be feeding him worms/protein until he’s a little older. Anyway, if you get the mealworms all you have to is cut off their heads. You shouldn’t crush them up. If you don’t cut the heads off they may stay alive inside the stomach and eat through it and kill the baby. Mockers will behead their worms or kill them prior to eating by beating them on the ground with their beaks. My good-natured 7-year-old cat enjoys being outside a lot during the day and is inside at night. Lately throughout the day he has been viciously harassed by 1 or more mockingbirds in both our front and back yards. The poor cat tries to hide but his only escape is returning inside. He tries going back outside, very carefully and with his eyes to the sky, but is soon intimidated again. The bird swoops too low and close to the cat. Much as I appreciate birds, it’s going to be difficult to fight my impulse to hurt it before it hurts my cat. I hope the water gun trick works to keep the bird(s) away. I can’t stay home all day as my cat’s bodyguard! And please don’t tell me that all cats should be indoors, period. My cat is not kept indoors, period. We’ve never had this problem before. I have a cat too and loves the outdoors. Around the side of the house I feed mockingbirds. I have no problem with them attacking my cat. This makes me think that you definitely have a mockingbird nest near by. If you can narrow down where the nest is, then maybe, and I do not know how, to keep your cat away from that area. The good news is that the babies will last a couple of more weeks and then leave their nest and the mockingbirds will leave your cat alone. Birds usually only attack because a nest is near unless your cat is being bothersome to the birds, but I do not think that is the case. It will stop when breeding season ends. Hopefully their next nest will be put farther away from your home. We have what we believe are mockingbirds in our front yard. While trimmig some trees, and bushes several weeks ago, my husband saw a few nests and stopped. Now these birds have taken over. We can not walk up the driveway to get the newspaper without getting dive bombed. My flowers are suffering since I almost get hit in the head 2 days ago. I’m afarid to go out there to water. I’ve read we should spray them with water, these birds are pretty fast, and they double team you. How often do these guys lay egg? Sorry, but I can’t wait for them to leave. I can’t allow my grandchildren to play in front of my house when they visit. This AM one was on our back deck. Anyone remember the movie The Birds? Alfrend Hichcock rides again. The birds we have do not sing, they squawk. One actually hissted at me a I was putting something in the trunk of my car. Living in Southern California, we have mockingbirds in our yard for most of the year. They never touch the bird seed we put out for the finches and sparrows. However, they become most noticeable in the spring when they dive down and help themselves to our beagle’s dry dog food. We don’t know if they take the added nourishment because they are working hard while nesting, or if they actually have more mouths to feed in the nest. Later we watch as they coax their little ones out of the nest. In the summer, they enjoy the many fruit trees in our yard, especially the figs. Later in the summer and in the fall, we notice their beautiful songs subsiding. Instead we hear them singing a monotonous and sad sounding “peep” over and over again. (I have never heard anyone describe this occurrence — only their incessent songs in the early spring.) During the winter they find nourishment from the red berries on our pyracantha and heavenly bamboo plants. We are so pleased they are enjoyig our yard. They have never attacked us – they are a joy to have around. I have noticed recently this summer in north Florida, as strange abscence of mockingbirds, threshers, and even blue jays. What is going on? Why have they disappeared? Could it be because of chemtrails, which are abnormal contrails in the sky, suspected of spraying heavy metals, particullarly aluminum, barium, and strontium? The skys are full of this particulate matter. This could also explain the strange sudden dying and falling out of the skys redwing blackbirds, and other types, across the country and world. This could also explain the disappearance of the honey bee in alarming numbers, CCD, colony collapse disorder. Could the aluminum and heavy metals be killing many insects that the mockingbird feeds on, and or directly killing these beautiful birds, which happen to be my state bird here in Florida. Pay attention and see if you also have noticed a sudden reduction or absece of mockingbirds in you area of the world. For a good expose’ film on YouTube.com, go to “What in the world are they spraying”, full length film, 2010, or http://www.coalitionagainstgeoengineering.com God bless you. This is serious business! Thanks for the responses to my post about the dive-bombing mockingbird(s). They stopped attacking my cat about a week ago, and peace has returned. Now we can fully enjoy the wonderful variety of birds (and the antics of the squirrels, one of whom I saw shocked to be a victim of a mockingbird!) in our yards. When the mockingbirds are so aggressive, they’re a genuine nuisance. Fortunately it’s a short-lived, seasonal problem. Why don’t Mockingbirds sing during Dog Days? I miss my morning / evening songs. My daughter lives in Southern California and for the last week a mockingbird has been hanging on the screens of the windows of the family room and then on their bedroom window screen when they move into that room. It is screeching at them. They do have an indoor cat, but it has never been outside. It is October now and they haven’t seen any nests. Why might this bird be in distress? I have a pair of mockingbirds living in my backyard. They’re both fun to watch. They like to gobble up the suet anf will do ANYTHING to get it. Last year they nested in our backyard without us knowing, and our cats got a baby. 🙁 He was fledged and when my brother found him before he went to school, he was chirping. They poor guys kept chirping until the end… it broke my heart. His siblings have grown up and dispersed. On another note, we also have some other Mimidae nesting in our backyard. Brown Thrashers nested last year and the cats brought in ALL the babies unharmed. The third and final one was the youngesy, his long tail feathers not yet grown in. His chirping (he was outside on our patio in the corner.) drove his parents and some Eastern Towhees crazy (I suppose babies sound alike.) I have returned them all to safety and to this day both parents and a youngster still visit my feeder for the suet, orange slices, and seeds. Mockingbirds will eat suet, fruit (I’ve seen them both eat the oranges and tomatoes) and for me, rarely seeds. I’m raising mealworms for the birds as well. I have a mockingbird that has laid two eggs in a nest that she made on my 4th floor balcony. The nest is in my satellite dish. The eggs were laid 4 days ago and I have trying to read up on mockingbirds. My concern for the babies will be the height of my balcony which is about 50 feet off the ground. Will this be a concern as far as the first flight?? I am in Los Angeles and have a lovely mockingbird (and perhaps even TWO) who have perched in the tree across the street. While I feel sorry for my neighbors nearest the chirper, his (or her) songs have made me feel sooooo good inside. It makes me appreciate the world as God made it. It is quite beautiful. I went out tonight and videotaped our little conversation (he got quite stage shy at first), and brought him water and some pepitas, which I’m not sure he’ll eat. I’ll be happily disturbed in my sleep until he finds a mate. We need to appreciate this life in all its glory as there are many things threatening it as never before. Hi there everyone! I live in Palm Springs, CA. Just two days ago (04.23.2013) I noticed a next in a large lemon tree next to my house. I think it is a mockingbird nest. The tree is right next to my A/C unit (not being used right now) and I stood up on the A/C unit and could see into the nest (without touching or disturbing it.) There were three eggs there and I noticed later there was a bird in there sitting on the eggs. Today, I’ve not noticed a bird in there, maybe for like six hours. Do you suppose the nest has been abandoned? I also have three cats that go outside for about an hour (I’m out there with them when they go out) and I bring them back indoors after an hour. They, nor I have disturbed the nest, but I’m wondering if the mother bird may still have abandoned the nest. How long do they sit on the eggs after the eggs are laid? I’ve read that it takes 12 days for the fledglings to leave the nest after they’ve hatched. Thanks for any info! Make sure your cats don’t get the babies when they leave the nest. They’ll be on the ground for a week before they can fly. Oh no a full week? my outdoor cat already got one, I am afraid of him catching the other one. The minute we know there are babies, the cats come into the house—it coinicides with summer, so they’re in anyway because it’s too hot in Arizona. Cats are the worst when it comes to finding baby birds and killing them, so we don’t take any chances. I posted on July 31 2012 about the mockingbird attacking my cat, and… it’s back. This time there’s a twist. I used to dislike blue jays for being so mean to other birds, but the blue jay seems to be protecting my property (and cat) from the dive-bombing mockingbird! At this point there is some semblance of peace for me and my cat. Meanwhile, my cat doesn’t go anywhere near the mockingbird’s nest, which is in the yard past my next-door-neighbor’s yard – in a very tall tree which my middle-aged cat could never climb. I wish the mockingbird wasn’t so paranoid and aggressively defensive, but I guess if you’re an endangered species you do all you can to nurture your offspring. My dog gets attacked when he gets near the nest but I can actually look at the babies and the parents don’t even bother me ever. They are all now gone from the nest and on the ground ready to fly away. No , they’re not endangered, but I like people to think so. That way they won’t hurt them. Update: The bluebird left and yesterday I was pretty much my cat’s body guard against the swooping mockingbird. However, today, no mockingbird. I do believe that one of the reasons it is endangered is that it makes itself so obnoxious that birds, cats, dogs, and people reach a limit of tolerance and finally kill it! I know the calm cat across the street lost its patience and killed a menacing mockingbird a couple years ago. So far my cat just tries to hide or sits out a mockingbird’s swoops. I just hope another one doesn’t try to nest nearby. Why don’t you leave your cat inside like every vet and animal orginazation tells you. I’ll bet your cat causes more problems outside than the bird does for being a bird. I have a cat. I keep it safe inside. Not like it used to be that’s why when you adopt a cat from a shelter they ask you to agree to not have it an outdoor cat. Lu, some of us are well aware of the importance of keeping a cat inside. However, some of us also have valid reasons for having indoor/outdoor cats – such as having feline escape artists who will get out in spite of people’s best efforts, or children in the household who intentionally or accidentally let the cats out, or perhaps a need to reduce an overpopulation of rodents, etc. My own reason is that my cat adopted me from two houses down the street, where the family neglected to neuter their cats. Before moving in with me, he grew up with other cats both inside and outside in the neighborhood. I definitely gave him a better life (and he has added great value to mine), but had I tried to keep him inside during the day, he would not have stayed. Plus trying to keep him inside during the day would reduce the quality of life not just for him but for all our family members (and visiting guests). He is now 9 years old and I’m hoping for another 9. I don’t expect to have another cat, but if so would certainly want it to be indoor only. It is easy for people to say keep your cat indoors, but when you rescue an outdoor cat it is very difficult to keep them inside. I have indoor/outdoor cats, they are very happy and have a much better life than they had before. They do not leave the yard when they go out and stay in when weather is bad. Please do not be so harsh until you have had to take a feral cat that was most likely going to have a short life and give them a good home. My cats are so happy, all people that meet them are amazed at the relationship we have with cats. I’ve had a Mockingbird greet me many times on my arrival into my driveway. It always seemed to know it was me. When other cars arrived it never seemed to greet & sing to them! I also recently heard the Mockingbird sing the sound of a Sea Gull ! I had to go outside to see it for myself. I really thought there was a Sea Gull outside the house, but no – it was that Mockingbird! This is the first year I’ve ever head them all hours of the night. Now I know why, after reading these interesting stories. I’ve yet to find out why the male bird won’t sing for a mate during the day, when all respectable females are awake! This question comes from a very weary poster who is a caregiver by day and needs to be alert, and a bird is interfering with some much needed sleep!!! There isn’t much you can *legally* do to keep a lonely male mockingbird from singing around the clock for a mate. To sleep better, I would suggest wearing earplugs or using an air purifier or fan for “white noise”. For what it is worth, if the male fails to pair up he’ll eventually get the point and abandon his territory. Domesticated cats now rank as the number one cause of wild bird death, to the point where some formerly common bird species are seeing population losses *in the millions*, according to a report I read. I would urge anyone with a feral cat problem to report it to animal control. I would also urge cat owners for the good of the cat and the birds alike to keep cats indoors at night. Some years ago, my spouse and I had a pet cat killed at 2 a.m. — we heard it shriek. It died of a broken neck, which could have come at the hands of just about any nocturnal threat: coyote, owl or raccoon. As to the matter of mockingbirds attacking people, research shows they can and do recognize individual people. That suggests to me that once on a bird’s bad side, always on a bird’s bad side. It’s probably easier to stay OFF the hit list than to calm down a bird that has already identified you or your pet as a threat. My theory is this: If you’re a regular sight in a male’s territory before nesting season, a mated pair will most likely leave you alone, providing you don’t approach their young too closely. In my case, not only did a pair of mockingbirds tolerate myself, my spouse, a dog and a cat in the yard, they even brought over their young throughout the nesting season to fledge in our backyard (as a precaution we escorted the cat to a side yard when we became aware that their fledglings were using a bush in our yard as a nursery for those first three weeks after the babies left the nest). Not only did our mockers apparently feel safe, they tolerated my spouse and myself standing beneath their final nest of the season, built in our backyard lemon tree! Based upon my experience, I expect that unless this pair are “burned” in a subsequent nesting season by someone attempting to scare them off, they will remain relatively trusting in the presence of people. We observed “our” mated pair chase off squirrels, crows and male stray cats but no people or pets were targeted whatsoever. That leads me to believe that in areas where a mockingbird pair are particularly aggressive, it probably has something to do with something or someone having harassed them in the past, leading them to enter a state of hypervigilance. Given that the rates of survival are so poor for mockingbird young — less than 50 percent from what I read — it’s hard to blame mockingbirds when they become overprotective parents. Leave them alone and chances are they’ll leave you alone, too! I have outside cats. They wear collars with bells, not one tiny bell, but 10 or more bells. I can hear them a block away. My trees have chicken wire on the bottom to keep cats, any cats, from climbing them. My cats were raised with birds though. The pigeons I feed walk over them and they don’t harm them. There was a feral cat who was killing pigeons daily, for sport. Not eating the entire birds. I finally trapped him and had him picked up. He was wild and not suitable for rescue ???? So there are precautions one can take to ensure some amount of safety for the birds, when one owns cats who refuse to stay indoors. Yall are incredible. All this anthropomorphizing of birds and wailing about them protecting their young when most of the aggressive ones are actually just that: AGGRESSIVE. Attacking other birds and driving them off from THEIR nests that they built. Well, birds of a feather, so maybe yall act like douchebags and expect other people to ascribe you a good reason too. The city where I live decided to trim and remove large trees on an adjacent street during the height of bird nesting season (early summer). I found this rather bizarre as it is illegal to knowingly disturb a nest site, and yet the city’s initial claim was that there were “no nests in those trees”. I pointed out that fish and game law enforcement would be notified otherwise. After all, if you don’t look for the nests, you can’t expect to find them! Around the same time the city began slating large, mature trees for removal, a mockingbird pair began setting up a nest in a neighbor’s yard, in a hedge that the neighbor recently trimmed. It occurs to me that one of the ways people inadvertently end up on a mocker’s hit list is by thoughtlessly pruning or removing shrubs, hedges and small trees that mockers have identified as nesting sites (and those sites may be occupied as early as March!). I admit I was fairly oblivious to the whole issue myself. But now that I realize just how many species of birds are impacted by poorly timed tree trimming and removal, I wonder why it isn’t illegal to drastically prune or remove trees out of season? For birds, I would imagine that second only to the problem of cat predation is poorly timed landscaping. The takeaway: Law or no law on the books, I would encourage anyone who wishes to make drastic changes to their landscaping, especially where trees and shrubs are concerned, to do so from September through the end of winter (climate permitting). i have a good relationship with several mockingbirds in my yard. They will come to my window and let me know if something is amiss on my property. After 25 yrs, all of the sudden, they are all gone. i am worried and miss them. Any ideas on what could be going on???? I love our mockingbird. She is a part of our family and has lived in our back yard (in the city) for about 2 years. Our young son named her “Loretta”. Mockingbirds choose a habitat for a reason, because it has plants or trees that produce berries or fruits (their food source), an open grassy yard (to forrage for worms), low branching dense shrubs (to nest) and wires or a “post” to keep a protective look-out from above. We share this earth with animals and nature, so if these birds find your yard appealing, they will call it home. I on the contrary, have intentionally set our yard up for her comfort. She has brought our whole family together and are in awe watching her behavior. At night weve always slept with white noise and haven’t heard a thing. I encourage everyone to take a few minutes to watch how smart and fantastic these birds really are, you would have a different view for sure. Our bird was here a year before we appreciated her. Now she has us all mock-birders, even my “tough guy” husband melts. We also have a longtime resident mockingbird but he is perfectly silent. We don’t know why he never makes a sound. Does anyone? Our neighborhood mockingbird just got killed by a thoughtless driver. I found him dead in the street. We miss him terribly. Will another mockingbird come to take his place? We hope so. It is painfully quiet without his songs. He had been here for several years. I miss him eating at the feeder too. Yes, another Mocker will come to take its place. We’ve had Mockingbirds in our front yard for five years now. Three of them have died as a result of hawk attacks and other territorial birds. While the female spent almost the entire winter alone this year, a male has joined her in our front yard. We have excellent dense shrubbery and trees for their nests. For the past two years, when they’ve had babies, they’ve brought them to the feeder to eat. I had three babies and two parent Mockers eating right outside my front window. It was the most awesome thing! They are also super smart. I feed them dried mealworms every morning. I made it such a routine and made the same whistling sound every day, that they now fly over from wherever they are when they hear my whistle (and I shake the mealworms). They will wait two branches above my head for me to fill the flat, open feeder with mealworms, and before I even turn around are already perched and digging in. They will also make an interesting sound to let me know they’re approaching. I graciously tell them it’s time for breakfast and bid them a good day and go inside to watch them through the window. In the winter, she got really anxious and territorial of her feeder. We have bushes and trees that have berries in the winter, and it was such a cold and frozen winter this year that our front yard was swarming with Robins (which I also love) because they were eating all of the berries. Not a single Robin even noticed the bird feeder with the mealworms, but you wouldn’t know it based on the Mocker’s behavior. She would fly in and chase them away if they got on a branch too close. I have other feeders in the back yard for my other birds along with a bird bath. The Mockers keep to the front and only go back to get water and other other birds stay in the back away from the Mockers. I thoroughly enjoy watching all of my birds in their natural surroundings. We have to house finches that made a next on one of our columns off our sunroom. I love opening the blinds slowly to watch them. When I do, mama Finch peeks over and just watches me and flies off if it move to much. We’re getting ready to remodel and add on to our house (including a covered porch, so I can sit outside and watch the birds), and I hope it doesn’t disturb the birds too much. We have a dog who is free to go in and out as she pleases, but is confined to our yard, and she pays no attention to any of the birds, and the birds don’t pay any attention to her. Now, bunnies, on the other hand. The phenomenon of a mockingbird singing at night is surely to be treasured? Rather than chasing a bird from its rightful habitat, the way to block out the “noise” is to use foam earplugs, which effectively make humans deaf to any noise in the higher registers (i.e., bird song). I have 3 sets of mocking birds around our house. The front tree the side tree and the hut where we park the lawn tractor. That hut is in the back yard where it is fenced in and the dogs come out from the house by a dog door. These three mama birds were protecting a chick that was on the ground that none of us noticed. I was outside playing with our German Shepherd… Outside the fenced area where I heard some horrible yipping coming from the yard…our little spaniel/ dachshund who is the gentlest little fella was being pecked by this mockingbird. The chihuahua went to the aid and gave that mockingbird a what for. It has swooped down on me and pecked me in the back twice when I am outside with the dogs Our Chihuahua won’t take guff from it. We know they are protecting the young but we do not see any young around at all except for the one time and thus far have not seen that one anymore. They may be nice looking birds and the state bird here in TX…but I wish they would take up residence else where. hopefully our little fledglings have left the nest. they are 11 -12 days old. mamma still dive-bombs us when we go near the nest. Do you know why this is? There were there babies in the nest a week ago and we found one that had died on the ground. The 2 that were left were really trying out their wings! hopefully they are safely tucked somewhere. mocking birds are very territorial and extremely protective of their young. I’ve seen mocking birds chasing big birds in flight to chase them away. I even saw a mocking bird pecking at a buzzard sitting on the neighbor’s roof. the “intruder” left. BTW, Margie MT, I didn’t know that mocking birds are the state birds of Texas. I live in Florida, and I thought they were our state birds. we love our mocking birds and I just wish they would get better along with all our flock of cardinals. My daughter found a baby mockingbird on the ground after a storm and brought it in to our house. I’ve read up on how to feed this baby mockingbird and have fell in love with it. It must be a female, because she doesn’t make a lot of noise. When I walk by she will open her mouth for me to feed her. The noises that bother me more is a tree frog that comes here every Spring. I love the birds and butterflies that come in the Spring. The Lord knows when a sparrow falls to the ground and sends someone to take care of them. My little baby is chirping, so I need to go feed her. Love all the posts!! Need an advice how to help a mockingbird chick. We had to adopt an orrpahe chick who is now grown up to start on its own. We brought the chick from nearby but the resident mockingbird attacks the chick. The chick cage is on the terrace and one mockingbird comes to the cage and tries to hit the chick with its beak. The chick was wounded twice. We tried to realise the chick before but on the next day we found the chick on the ground with wounded wing . We are afraid to realise the chick again with such aggressive adult mockingbird. I have read many websites and it seems that there is no information on this siruation. Hi Irina, I am not an expert, but recently raised a baby mockingbird from nestling to now Aug. 6th, and am about to release it very soon. I know this was a while ago for you and I hope and pray you were able to release him/her safely. Your best bet would have been to keep him as long as you could substituting the mother and until his tail feathers were long enough and strong, that way it could have a better chance of standing up to the other adult mockingbirds and other predators. Sorry, I am only just stumbling on this website and posted my own experience. It required a lot of dedication on my part, but was worth it. He/she is so beautiful and smart and about to be set free. The 10th will be about 30 days of nurturing, feeding and always being with it when we let it outside, that way we warded of the predators and protected it. What ever you did, you tried your best I’m sure. Hope it worked out for you. I am so upset. We have had some mockingbirds feeding a nest in our yard. Yesterday I noticed that the babies were coming out of the nest. I took a few pictures of them but left them alone, of course. This morning I woke up and found one dead in our pool and another just dead in the yard. I feel so terrible. I can’t believe I wasn’t around to save the one in the pool. I just found out that they are mockingbirds yesterday. Does this happen a lot to their babies. I feel so bad about the one in the pool. I hope there are more and that someone survived. The parents seem to be gone. It’s very quiet out there this morning. Anyone else experience anything like this? I can imagine why the other one died. What would just kill and then leave it in the yard? We live in Malibu. Thanks for any insight into this. I am shocked at the number of people who are annoyed by such beautiful creatures. Thanks to the ones who do see their beauty and appreciate what the Lord has created. I live in a residential area where there are a lot of Mockingbirds, they just go about their business trying to survive. We had three nests in our front and side bushes and trees. One Cardinal nest and 2 mockingbird nests. We could see the babies growth right from our window. It truly is amazing to see the dedication of the parents to these babies, unfortunately there are many predators that they have to ward off. We would try and help ward off some of the predators by going outside if we heard something, and I believe the birds could sense this, they were always calm around us and never dive bombed any of us when we would go to check on their babies. Then it happened… My neighbor was out walking and found a baby bird on the ground. The other 2 babies were dead, one was stomped on and the other dead, soooo… sad! Well, long story short we ended up with the baby bird. It was a nestling about 2 to 3 days old. I called a couple of numbers for rehabilatators but no one returned my calls, so off to petco we went. With the natural motherly instincts along with the pet store and Internet, we were off to try and help this baby bird survive. We got the bird on the 10th and it is now Aug. 6. We have kept the baby outside in our enclosed patio and tried to make it suitable. Using a heating pad for warmth, bought a small tree and my husband made 2 perching poles. He is now flying but his tail feathers are still not fully out so we are waiting just a little while longer so he has a better chance for survival outside. We have stray cats from the neighbors and are always chasing them off. We kinda new it was a mockingbird and sure enough his beautiful feathers confirmed it. I would not recommend just anyone take this on, it requires a big responsibility, feeding every 15 min.s when a nestling, then every 30 min.s and then every hour from sunup to sundown. The bird is so smart and I am confident he has learnt some of the skills needed for his/her survival. I work in the school system so have summers off, and between myself and my 18 year old daughter, we have nursed this baby mockingbird from nestling to now. Excited to set him/her free, have introduced to catching his own bugs and has even flown up on our neighbors roof. But flew back down to our hands, still not ready for the challenging crows and Hawks. Will be sad to see him go, have had a beautiful experience nurturing the little guy. Am so proud of this accomplishment. People should really just see the beauty in these birds and all birds. They may be surprised at how they just might sleep peacefully. Just for thought, if you do find a baby bird, I would highly recommend seeking a rehabilitator unless you are ready for a major commitment to raise this baby bird. Keep trying to find someone to respond, they deserve that. They are beautiful creatures!!! I had a Mockingbird nest right outside my garage with 4 eggs that did hatch. The babies seemed to be doing really well despite some severe storms. I checked them once a day and yesterday they looked great………eyes open and peeping. I think they were about 2 weeks old. This morning when I went out, the next was empty and I found a bit of feather just below the nest on the ground. No sign of the parents. I am so sad. Will they use the same nest again? Is there something I can do to protect the nest and not interfere with the parents? Where Are You Birding This Fourth Weekend of August 2009? What is the State Bird of Florida?